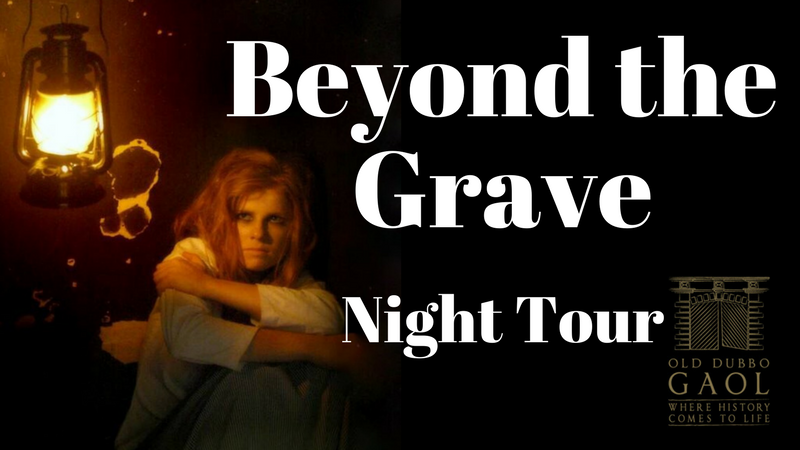 You are currently selecting tickets for the 26/04/2019 (9:00pm - 10:30pm) Beyond the Grave Night Tour - Old Dubbo Gaol. This event has multiple dates or times.If you wish to change to a different event, please select a date, then a time before selecting tickets. The Beyond the Grave night tour is for those who dare enter the Old Dubbo Gaol after dark. Using EMF readers, your group will attempt to communicate to those whose spirits still linger within our walls. You will also hear the darker tales of the Gaol, stories of illness and death, punishment and executions. Not for the faint of heart the Beyond the Grave Tours only run in the NSW School Holidays or by group bookings. The Tour includes day entry between 9am and 4pm either the day of or the day after your tour. 1. Payment for a Beyond the Grave Night Tour is non-refundable. All sales are final and amendments or exchanges cannot be made. 2. The purchase of this ticket includes Beyond the Grave Night Tour and a full day general admission on the same date or the following date of selected session only. 3. Latecomers will not be admitted after the tour has started. Roll Call commences at 8:45PM. The tour starts at 9:00PM. 5. Students, who are under 18 years of age, must be accompanied by a responsible adult. 7. Admittance to all customers bearing Beyond the Grave Night Tour Tickets will only be granted upon production to Gaol Staff of relevant ID on the night of the Beyond The Grave Night Tour.